May some of you can watch Star Sports? Something looked really off in FP1, we'll see if it continues in FP2. and they got mad because Kimi brought up that what???? oh god, that lotus has financial problems??? oh wow!!!!!!!! Yep, I have desided not to care anymore what Lotus might have in their bag. Its clear they are in deeper trouble they want to tell, even Aero Gallo is now talking about money. I think the fact Lotus is owned by investment company, isnt doing any favour to them. Investment company negotiates from its own interests, not from teams point of view. Lopez is probably trying to get the slice of every sponsor deal for his company and maybe sponsors doesnt like that. TS says that Kimis setups are ****ed up.Car pushing badly in corners and brake balance is not working at all so he can't go to corners like he should. Apparently they went the wrong way the balance of Kimi's car. 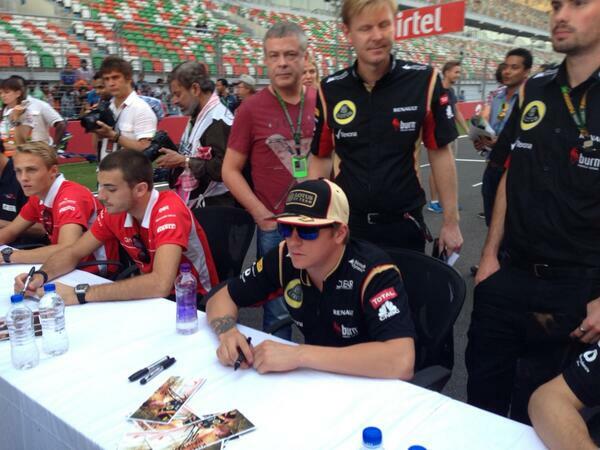 Kimi Raikkonen says he is still unhappy with the front end on his Lotus after practice for the Indian Grand Prix. With Romain Grosjean having outqualified Raikkonen at each of the last three races, Raikkonen has attributed his inability to match his team-mate over one lap to issues with the front Pirelli tyres. After practice in India - where Raikkonen was again over 0.4s slower than Grosjean - he said an error he made prevented him from finding a solution to his problem. "I flat-spotted my hard set of tyres on the first lap so they were pretty much useless after that," Raikkonen said. "I used them at the end for a few laps but there was so much vibration that I couldn't see and obviously it doesn't help. Then we just tried a few things and at certain times the car didn't feel too bad. "We have some issues with the front end; I'm not happy about it but it's hard to get rid of it because there are certain rules on the safety side of the tyres with the new tyres. It wasn't too bad at certain times but not ideal, so we'll see." While Raikkonen admitted that he too had some issues with his front left soft tyre, he said they were mainly self-inflicted. "We had some [front-left problems] but we changed the set-up a lot so I think we created some of the blistering and graining on the soft tyres ourselves, so I wouldn't be too worried about it."